Conventional lithium ion batteries, such as those widely used in smartphones and notebooks, have reached performance limits. Materials chemist Freddy Kleitz from the Faculty of Chemistry of the University of Vienna and international scientists have developed a new nanostructured anode material for lithium ion batteries, which extends the capacity and cycle life of the batteries. Based on a mesoporous mixed metal oxide in combination with graphene, the material could provide a new approach how to make better use of batteries in large devices such as electric or hybrid vehicles. High energy density, extended cycle life and no memory effect: Lithium ion batteries are the most widespread energy storage devices for mobile devices as well as bearers of hope for electro mobility. Researchers are looking for new types of active electrode material in order to push the batteries at the next level of high performance and durability, and to make them better usable for large devices. "Nanostructured lithium ion battery materials could provide a good solution", says Freddy Kleitz from the Department of Inorganic Chemistry – Functional Materials of the University of Vienna, who together with Claudio Gerbaldi, leader of the Group for Applied Materials and Electrochemistry at the Politecnico di Torino, Italy, is the study’s main author. The 2D/3D nanocomposite based on a mixed metal oxide and graphene, developed by the two scientists and their teams, seriously enhances the electrochemical performance of lithium ion batteries. "In our test runs, the new electrode material provided significantly improved specific capacity with unprecedented reversible cycling stability over 3,000 reversible charge and discharge cycles even at very high current regimes up to 1,280 milliamperes", says Department Head Freddy Kleitz. Today’s lithium ion batteries lose their performance after about 1,000 charging cycles. Conventional anodes often exist of carbon material such as graphite. "Metal oxides have a better battery capacity than graphite, but they are quite instable and less conductive", explains Kleitz. The researchers found a way to make best use of the positive features of both compounds. They developed a new family of electrode active materials, based on a mixed metal oxide and the highly conductive and stabilizing graphene, showing superior characteristics compared to those of most transition metal oxide nanostructures and composites. As a first step, based on a newly designed cooking procedure, the researchers were able to mix copper and nickel homogenously and under controlled manner to achieve the mixed metal. 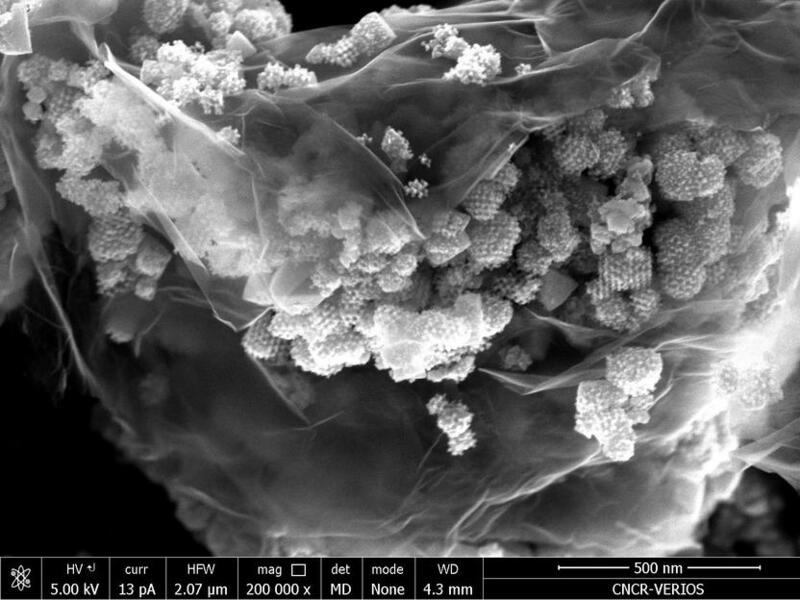 Based on nanocasting – a method to produce mesoporous materials – they created structured nanoporous mixed metal oxide particles, which due to their extensive network of pores have a very high active reaction area for the exchange with lithium ion from the battery’s electrolyte. The scientists then applied a spray drying procedure to wrap the mixed metal oxide particles tightly with thin graphene layers. The use of lithium ion batteries for e-mobility is considered problematic from an environmental point of view, e.g. due to their raw material-intensive production. Small batteries that can store as much energy as possible, last as long as possible and are not too cost-intensive to manufacture could advance their use in large-scale devices. "Compared to existing approaches, our innovative engineering strategy for the new high-performing and long-lasting anode material is simple and efficient. It is a water-based process and therefore environmentally friendly and ready to be applied to industrial level", the study authors conclude.